Sergio Osmeña (September 9, 1878 - October 19, 1961) was a Filipino politician who served as the fourth President of the Philippines from 1944 to 1946. He was Vice President under Manuel L. Quezon, and succeeded as President upon Quezon's sudden death in 1944, becoming the oldest officeholder at age 65. 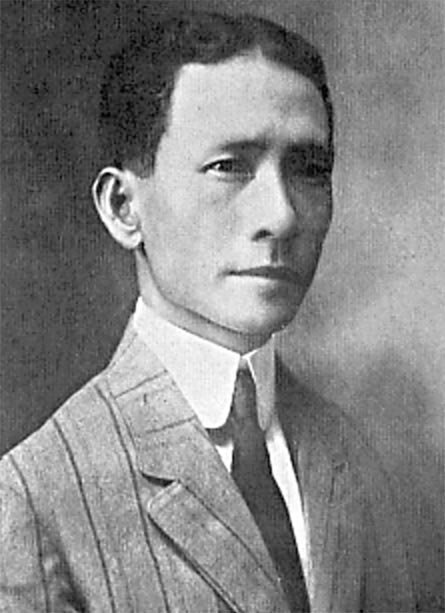 A founder of Nacionalista Party, he was also the first Visayan to become President of the Philippines. Prior to his accession in 1944, Osmeña served as Governor of Cebu from 1906 to 1907, Member and first Speaker of the Philippine House of Representatives from 1907 to 1922, and Senator from the 10th Senatorial District for thirteen years, in which capacity he served as Senate President pro tempore. In 1935, he was nominated to be the running-mate of Senate President Manuel L. Quezon for the presidential election that year. The tandem was overwhelmingly re-elected in 1941. He was patriarch of the prominent Osmeña family, which includes his son, former Senator Sergio Osmeña, Jr., and his grandsons, senators Sergio Osmeña III and John Henry Osmeña), ex-governor Lito Osmeña, and former Cebu City mayor Tomas Osmeña. The seal of National Bank is right of center. In lower left corner - The first Philippine Assembly of 1907. 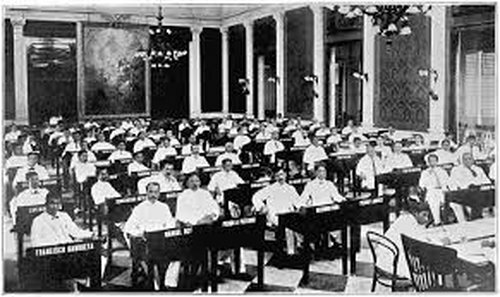 The Philippine Assembly (sometimes called the Philippine National Assembly) was the lower house of the Philippines from 1907 to 1916. Along with an upper house (the appointed Philippine Commission), it formed the bicameral Philippine Legislature during part of the American Colonial Period. The Assembly was created by the 1902 Philippine Organic Act of the United States Congress, which established the Insular Government of the Philippines. In 1916, the Jones Act replaced the Philippine Organic Act and the Assembly became the current House of Representatives of the Philippines. The first Philippine Assembly elections were held on July 30, 1907. These were the first nationwide elections ever held in the Philippines. The Assembly was inaugurated on October 16, 1907 with Sergio Osmeña as Speaker of the Assembly, Manuel L. Quezon as majority leader, and Vicente Singson as minority leader. The inauguration of the assembly marked a "turning point in the country’s history, for its creation marked the commencement of Filipino participation in self-governance and a big leap towards self-determination." The Philippine Assembly was the first legislative body in the Philippines fully chosen by national elections. It is a direct precursor of the current House of Representatives of the Philippines. At the bottom, centered, is the memorial, dedicated to landing at Red Beach, Leyte, 20 October 1944. 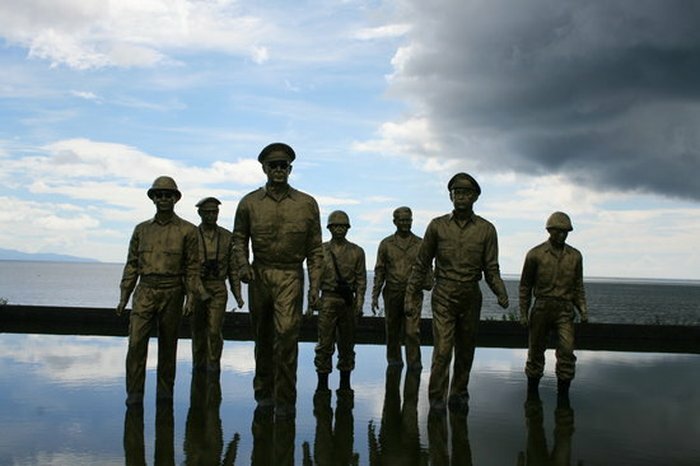 The most famous military monument is the memorial park on Red Beach Beach in the small town of Palo next to Tacloban. 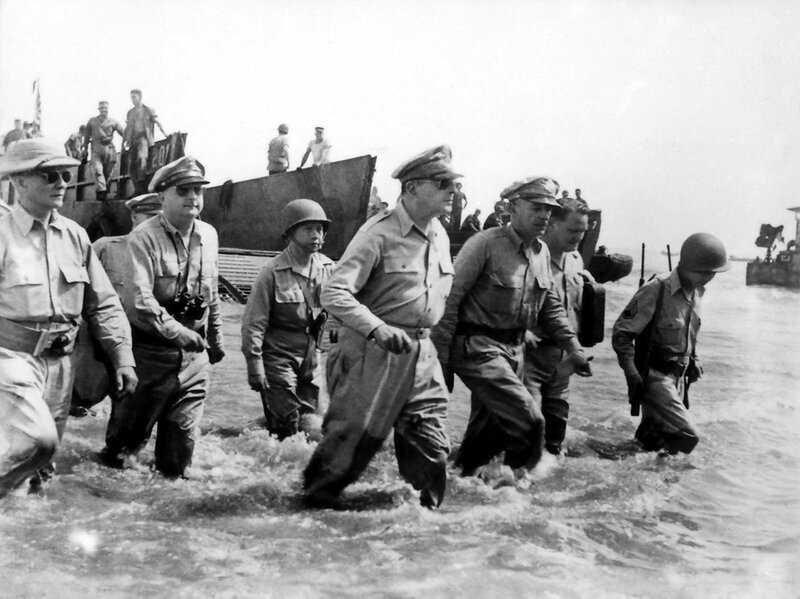 It was here that American troops landed under the command of General MacArthur. Today, statues of one and a half human height, depicting the general and his companions, are installed on this place. By the 50th anniversary of the historic event, a beautiful park was laid out around the memorial, overlooking the Leyte Gulf and Samar Island. The Battle of Leyte (Filipino: Labanan sa Leyte, Waray: Gubat ha Leyte, 17 October – 26 December 1944) in the Pacific campaign of World War II was the amphibious invasion of the island of Leyte in the Philippines by American forces and Filipino guerrillas under the command of General Douglas MacArthur, who fought against the Imperial Japanese Army in the Philippines led by General Tomoyuki Yamashita. The operation, codenamed King Two, launched the Philippines campaign of 1944-1945 for the recapture and liberation of the entire Philippine Archipelago and to end almost three years of Japanese occupation. 1) Taal Lake, Taal Volcano and Binintiang Malaki in Batangas. 2) Caranx ignobilis, maliputo (giant trevally). 3) Batangas (Taal) embroidery design. 4) Map of the Philippines with a marked province of Batangas. Taal Lake, Taal Volcano and Binintiang Malaki in Batangas. In fact, many people mistakenly take one of the 47 summits and craters of the Taal volcano - Binintang Malaki for the volcano itself. 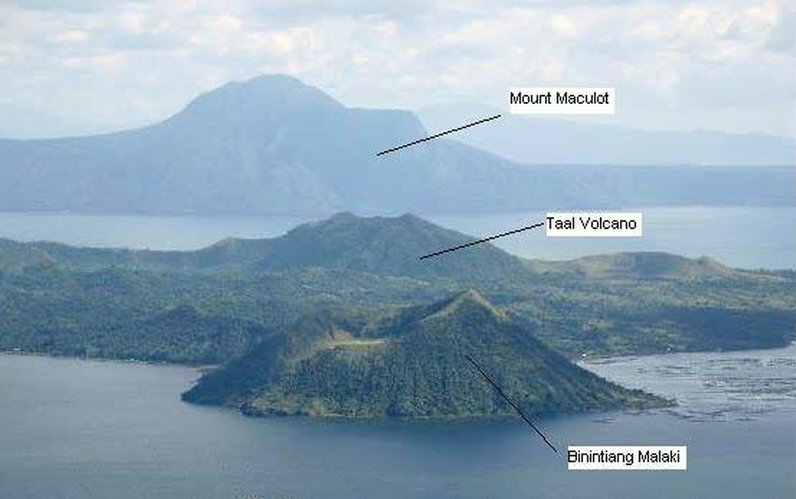 The photo shows where the volcano itself is located, and where Binintang Malaki is located. Taal Lake, formerly known as Bombón Lake, is a freshwater lake in the province of Batangas, on the island of Luzon in the Philippines. The lake fills Taal Caldera, a large volcanic caldera formed by very large eruptions between 500,000 and 100,000 years ago. It is the country's third largest lake after Laguna de Bay and Lake Lanao. Volcano Island, the location of Taal Volcano's historical eruptions and responsible for the lake's sulfuric content, lies near the center of the lake. There is a crater lake on Volcano Island. Known as the Yellow Lake or the Main Crater Lake, it contains its own small island, Vulcan Point. Vulcan Point was thought to be the largest third order island in the world but Treasure Island (Ontario) is much bigger and is thought to be the world largest, and is also on a freshwater lake. Taal Volcano (Filipino: Bulkang Taal) is a complex volcano located on the island of Luzon in the Philippines. It is the second most active volcano in the Philippines with 33 historical eruptions. All of these eruptions are concentrated on Volcano Island, an island near the middle of Taal Lake. The lake partially fills Taal Caldera, which was formed by prehistoric eruptions between 140,000 and 5,380 BP. Viewed from Tagaytay Ridge, Taal Volcano and Lake presents one of the most picturesque and attractive views in the Philippines. It is located about 50 kilometers (31 miles) south of the capital of the country, the city of Manila. The volcano had several violent eruptions in the past causing loss of life in the island and the populated areas surrounding the lake, with the death toll estimated at around 5,000 to 6,000. Because of its proximity to populated areas and its eruptive history, the volcano was designated a Decade Volcano, worthy of close study to prevent future natural disasters. All volcanoes of the Philippines are part of the Pacific Ring of Fire. The giant trevally (Caranx ignobilis), also known as the lowly trevally, barrier trevally, giant kingfish or ulua, is a species of large marine fish classified in the jack family, Carangidae. The giant trevally is distributed throughout the tropical waters of the Indo-Pacific region, with a range stretching from South Africa in the west to Hawaii in the east, including Japan in the north and Australia in the south. Two were documented in the eastern tropical Pacific in the 2010s (one captured off Panama and another sighted at the Galápagos), but it remains to be seen if the species will become established there. The giant trevally is distinguished by its steep head profile, strong tail scutes, and a variety of other more detailed anatomical features. It is normally a silvery colour with occasional dark spots, but males may be black once they mature. It is the largest fish in the genus Caranx, growing to a maximum known size of 170 cm. (67 in.) and a weight of 80 kg. (176 lbs.). The giant trevally inhabits a wide range of marine environments, from estuaries, shallow bays and lagoons as a juvenile to deeper reefs, offshore atolls and large embayments as an adult. Juveniles of the species are known to live in waters of very low salinity such as coastal lakes and upper reaches of rivers, and tend to prefer turbid waters. The giant trevally is an apex predator in most of its habitats, and is known to hunt individually and in schools. The species predominantly takes various fish as prey, although crustaceans, cephalopods and molluscs make up a considerable part of their diets in some regions. Footage released in 2017 on Blue Planet II showed a grouping of giant trevally hunting birds in Farquhar Atoll in the Seychelles. The species has some quite novel hunting strategies, including shadowing monk seals to pick off escaping prey, as well as using sharks to ambush prey. The species reproduces in the warmer months, with peaks differing by region. Spawning occurs at specific stages of the lunar cycle, when large schools congregate to spawn over reefs and bays, with reproductive behaviour observed in the wild. The fish grows relatively fast, reaching sexual maturity at a length of around 60 cm. at three years of age. 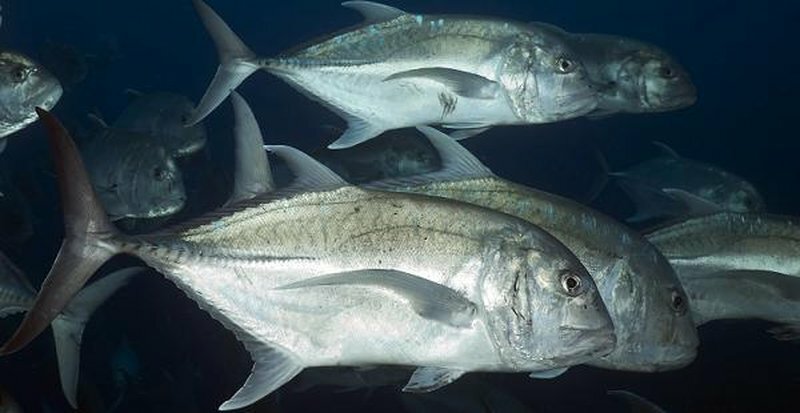 The giant trevally is both an important species to commercial fisheries and a recognised gamefish, with the species taken by nets and lines by professionals and by bait and lures by anglers. Catch statistics in the Asian region show hauls of 4,000-10,000 tonnes, while around 10,000 lbs of the species is taken in Hawaii each year. The species is considered poor to excellent table fare by different authors, although ciguatera poisoning is common from eating the fish. Dwindling numbers around the main Hawaiian Islands have also led to several proposals to reduce the catch of fish in this region. Across all field of banknote is Batangas (Taal) embroidery design.